It is well accepted that trade generates winners and losers. The past few decades have seen increases not just in trade in goods and services but trade in assets, as countries relax restrictions on the ability of capital to flow across national boundaries. Surprisingly, while the impact of trade in goods and services on inequality has been extensively studied, little attention has been paid to the distributional impacts of opening up capital markets. Our paper fills this gap. 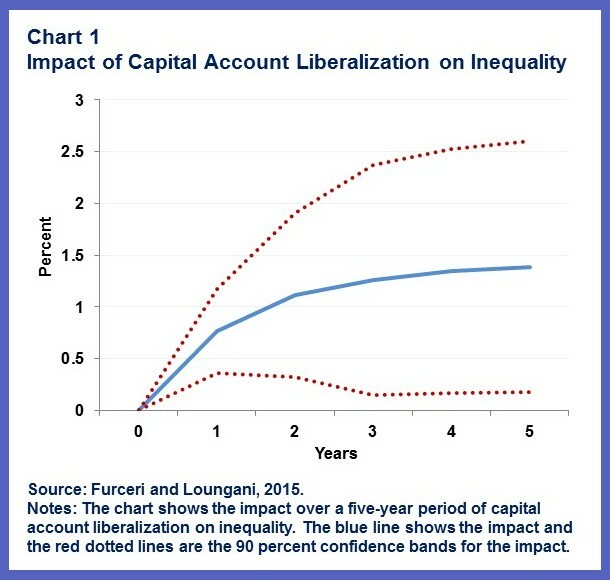 Chart 1 shows the impact over a five-year period of capital account liberalization on inequality, as measured by the Gini Coefficient. Our measure of capital account openness is the Chinn-Ito index, which measures a country's openness based on the restrictions on cross-border financial transactions reported by the IMF. The index varies greatly across income groups, but capital account openness has increased in all income groups, with a significant rise occurring at the beginning of the 1990s. Capital account liberalization has typically increased the Gini index by 1 percent within two years of the liberalization and by 1.5 percent within five years. The robustness of this qualitative result to various stress tests is extensively documented in our paper. Why is openness associated with a rise in inequality? We suggest two possibilities. First, it is commonly argued that the benefits of capital account liberalization depend on the quality of financial institutions. 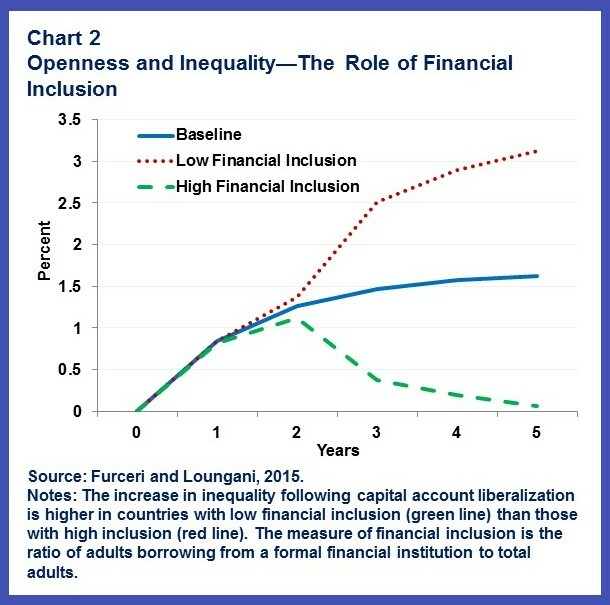 Where institutions are weak and the access to credit is not inclusive, liberalization may exacerbate inequality by increasing the bias in financial access in favor of the privileged. Indeed, we find that the increase in inequality in the aftermath of liberalization is higher in countries where financial inclusion is lower (Chart 2). Second, when capital account liberalization is not well managed, or not well sequenced with other reforms, it increases the likelihood of financial crises. Many studies have found that such crises disproportionately hurt the poor. 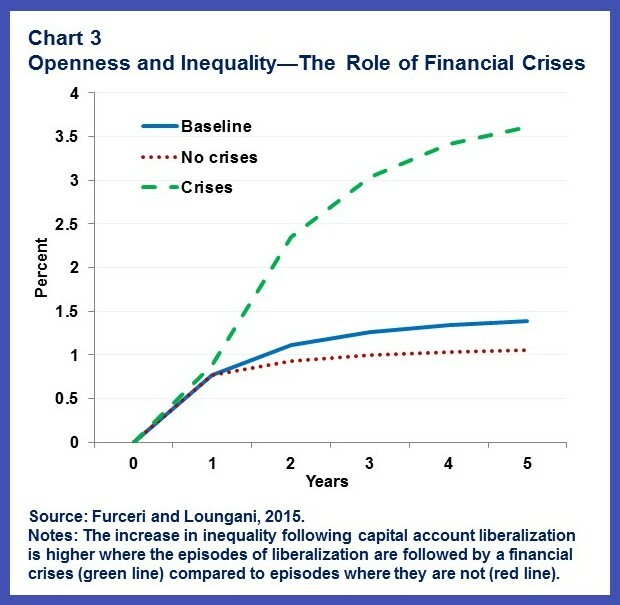 We find support for this view: the impact of openness on inequality is sharply higher in cases where there a financial crisis in the immediate aftermath of liberalization (Chart 3). Our findings, however, suggest a need for proceeding with caution, given that capital flows can be volatile and—particularly given their large size relative to domestic markets—can pose a risk to economic and financial stability. Further, countries where reducing inequality is an important policy goal may need to design liberalization in a manner that addresses its impact on inequality. The institutional view also notes that capital flow liberalization is generally more beneficial and less risky if countries have reached certain levels or thresholds of financial and institutional development. Here again, our results are consistent with this view. Where financial inclusion is high and the liberalization well managed, the impact of liberalization on inequality is muted. At a time when rising inequality is a source of concern to many governments, weighing the benefits of capital account liberalization against the distributional effects may be important. Awareness of these effects might lead some governments to choose to design policy actions in a way that redresses the distributional impacts.